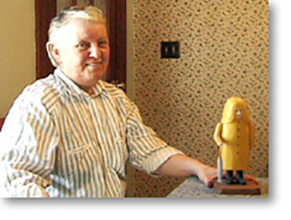 The mother of four grown children, Phyllis took up carving around 1984. Her work consists almost exclusively of small polychrome carvings of people from her community. Phyllis participated in several folk art festivals between 1990 and 1994, but has not participated in any since 1994. In 1995, the Art Gallery of Nova Scotia purchased virtually all of the work she had done over the previous winter. Never a prolific carver, Phyllis has been limited in her ability to carve since 1996 because of arthritis, and her work is becoming increasingly difficult to find. Ref: Nova Scotia Folk Art Festival Society, A Joyous Vision - Contemporary Folk Art in Nova Scotia (1995); Folk Art Festival Society News (Fall, 1996); McKendry, An Illustrated Companion to Canadian Folk Art (1999).